JUNE 7, 2017, STENNIS SPACE CENTER, Miss. (NNS) – Over 300 people attended the first Naval Oceanography Unmanned Systems Operational Demonstration May 31 – June 2, hosted by Commander, Naval Meteorology and Oceanography Command (COMNAVMETOCCOM) at the Combat Readiness Training Center-Battlefield Airmen Center in Gulfport, Mississippi. To simulate Navy missions for the demonstration and test unmanned systems capabilities, the participants performed Fleet mission areas such as Humanitarian Assistance/Disaster Relief (HA/DR); Sea Control; Theater Anti-submarine Warfare (ASW); Intelligence, Surveillance and Reconnaissance (ISR); as well as a Cyber Challenge and an Unmanned Maritime Systems Certification program. The Mississippi Gulf Coast is too familiar with natural disasters that change the battlespace environment. The HA/DR mission combined near-shore data collection capabilities utilizing multiple IVER-3s and REMUS 100s to collect bathymetry and side scan sonar data. The data provides water depths and tactical recommendation products as well as hazards to navigation, clear transit and anchorages for incoming support vessels. Accurate characterization of the physical environment is critical for planning tactical operations. Intelligence, Surveillance and Reconnaissance events utilized both airborne and underwater unmanned systems to contrast data product accuracy with environmental characterizations of riverine operations used by Special Boat Team 22. While an OceanServer IVER-3 vehicle and a 3D Robotics Solo Quadcopter rapidly collected bathymetry and topography, a GhostSwimmer – tuna-sized, biomimic, swimming vehicle – inspected the area for threats prior to mission execution. In any environment, it is imperative that Navy forces understand the ocean and atmosphere. The Theater ASW mission provided near real-time oceanographic data to show how an accurate assessment of sound speed profiles better represents the ocean’s effects on sonar performance. 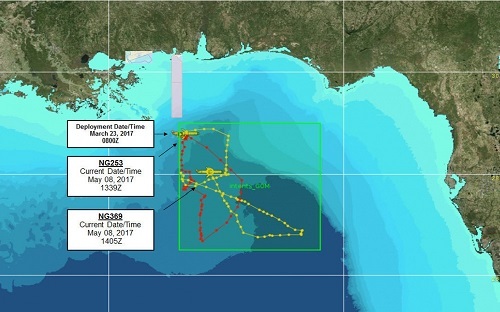 The Naval Oceanographic Office (NAVOCEANO) worked with the U.S. Air Force 53rd Weather Reconnaissance Squadron “Hurricane Hunters” to deploy profiling floats to measure conductivity, temperature and depth and drifters to track ocean currents and changing water column properties. These unmanned systems continuously collect data that is communicated to NAVOCEANO, who then processes it into ocean and atmospheric models that run on supercomputers at the Navy DoD Supercomputing Resource Center. 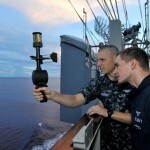 Knowing the environment improves the Fleet’s ability to safely maneuver and maintain command of the seas. 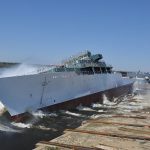 The Sea Control mission focused on deploying multiple, networked unmanned underwater and surface systems from USNS Maury (T-AGS 66) to deliver environmental assessments in support of surface navigation safety and mine countermeasures. As these systems collected bathymetry data, they would communicate positions back to a Maritime Operations Center (MOC). The future intent is to have all unmanned systems reporting their locations back to the 24/7 CTG 80.7 Command Center. COMNAVMETOCCOM directs and oversees more than 2,500 globally-distributed military and civilian personnel who collect, process and exploit environmental information to assist Fleet and Joint Commanders in all warfare areas to make better decisions faster than the adversary.